Not all LDL cholesterol is created equal. LDL-cholesterol consists of particles that vary in size, density and chemical compositions as well as in physiologic properties and atherogenic potential. Large, buoyant LDL (subfractions 1 and 2) represent the “good” LDL responsible for the transport of cholesterol to peripheral tissues for cell membrane maintenance, bile acid synthesis by the liver and for the production of steroidal hormones. It is the small dense LDL, however, that are prone to oxidation, and are demonstrated by multiple clinical studies to be an independent risk factor for cardiovascular disease. 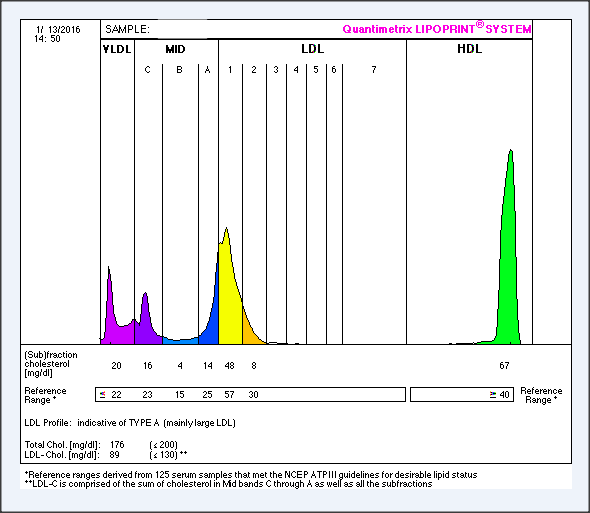 Small dense LDL is a component of the lipid triad associated with atherogenic dyslipidemia (the other two components being increased plasma triglyceride levels and decreased HDL-cholesterol concentrations). Predominance of small dense LDL increases the risk of CVD by 3-fold even at “normal” concentrations of LDL cholesterol (1). LDL particle size and density are influenced by genetics, diet and body weight — and dietary interventions have demonstrated measurable effects. 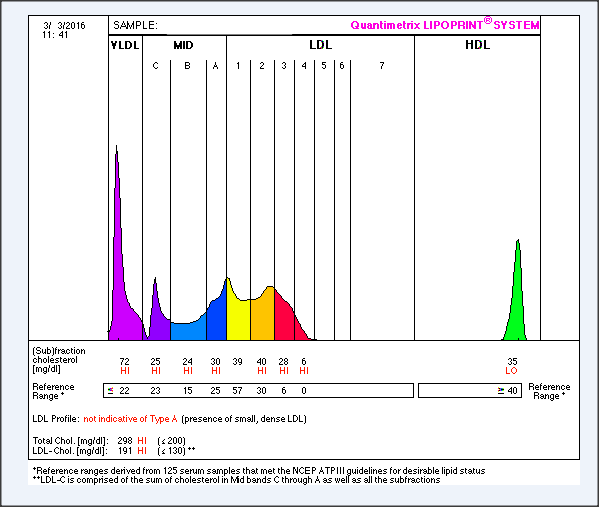 LipidPro LDL provides a colour coded profile that measures up to 12 lipoprotein fractions and subfractions. Elevated Mid B, Mid C and small-dense LDL 3 to LDL 7 pose the highest risk for CVD (as shown by images below). The detailed analysis assists health practitioners with identifying individuals requiring dietary or medical therapy and lifestyle changes, the success of which can be measured through retesting after a 3 month period of therapy.